Carry around your 4th of July spirit with this American Striped Crochet Bag pattern. It is large enough to fit everything you need for a picnic, but small enough that you don't feel weighed down. The bottom even sits like a cube so you can easily organize things inside of it or set it down without it falling over. Enjoy this crochet tote bag pattern to bring all the best food to the gathering while you enjoy the fireworks on this 4th of July, or show off your spirit for Labor Day later on in the summer as well. I love the look of this market bag! Like most bags meant to be functional rather than just decorative, this pattern calls for doubling the yarn. Thats what gives the tweed sections their distinctive look. 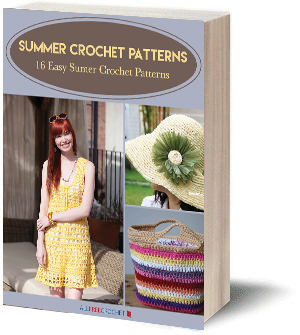 The pattern is easy to follow and well illustrated with step by step photos. You dont have to stick with the patriotic themethis bag would look great worked up in lots of different colors. Love the look of this bag! Using two strands of yarn at all times will make this bag very sturdy. You are creating your own variegated yarn by combining one of the strands in one color and the other strand in another color. A good tip for other projects where you would like a variegated yarn. What a great and usable idea for the base of the bag, making it in the cube shape. I appreciate that feature! This pattern will be easy to work up, with very detailed instructions provided. The "American Striped Crochet Bag" is so darn cute, I think we all need one.